12th September 2017, New Delhi: This is a study of consumer experience after 2 months of Goods and Services Tax (GST) implementation in India. GST is supposed to make not just the collection of tax more efficient but also in bringing down the net impact of taxes on prices. At least that was one of the initial promises of GST. The Government has made several process changes over the last 10 weeks to facilitate the filing of GST returns. It has also waived the penalty of late GST returns for July. Citizens pointed out that their expenses have increased post GST. There are various reasons for it and increased transportation costs is one of them. Transporters have increased their rates due to the increase risk of challans due to the requirement of e-way bill post the implementation of GST as well as the increased fuel prices. Retailers are also wary of the new rules and are trying to sell products closer to the MRP by offering lesser discounts. The retailers are also not reducing prices of products on which taxes have reduced but passing the burden on to the consumers where the rates have increased. The Reverse Charge Mechanism levies GST on procurement of any taxable goods or services from unregistered persons. This becomes unfair to the small suppliers and creates lot of practical issues. All these issues combined have resulted in the customer being squeezed from all sides. 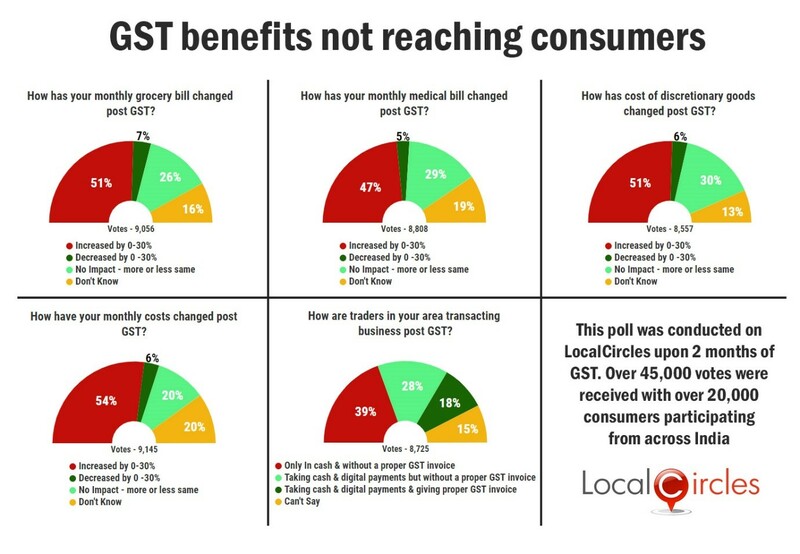 LocalCircles conducted a series of polls to understand how the implementation of GST has impacted the consumers. Questions cover monthly bill, grocery cost, medicine cost, entertainment cost etc. of common citizens in India. The polls received more than 40,000 votes. Majority of the citizens, 54 % said their monthly cost have gone up by 30 % due to GST, while 20 % said there has been no impact. A substantial portion of people also said they did not know the monthly cost impact as they did not monitor it very closely. Around 9,145 citizens voted on this poll. Many consumers had earlier reported that some retailers and manufacturers were charging GST over and above MRP and some were charging it even on discounted MRP. This was eventually distorting prices upwards raising the overall cost. Such practices are against Government’s MRP law and the government is trying to address these issues. Organised retailers even known e-commerce companies have been found violating the MRP laws by charging GST on top of MRP. The second question asked how the monthly grocery expenses have been affected in the last 2 months. Around 51% responded saying that it has increased between 0-30%, 7% said it has reduced, 26% said there was no impact and 16% were not sure about it. A total of 9,056 citizens voted on this poll. Food prices do witness a seasonal hike in prices during monsoon, particularly fruits and vegetables due to availability. The third poll received 8,808 responses, with 47% people said that their monthly medical expenses has increased in the last 2 months post GST. 5% said it had decreased post GST, 29% said there was no impact and 19% were not sure about it. A large part of the pharmaceutical retail was carried out in the past in cash and proper bills though mandatory requirement under law are not issued to consumers. Post GST, the retailers have been forced to report their sale revenue properly, this has led to billed purchases, lesser discounts and eventually higher rates for consumers. The artificial discount on prices which existed due to tax avoidance has vanished from the retail trade. In the fourth poll 39% people said that traders in their area are insisting on cash transactions and not issuing a proper GST invoice. 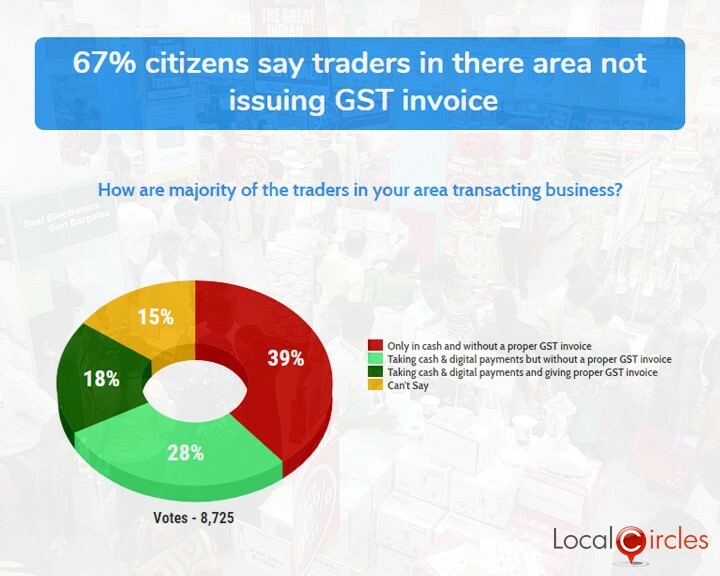 28% said traders were taking cash and digital payments but without a proper GST invoice. Only 18% said that traders were accepting both cash and digital payments and giving proper GST invoices. 15% were not sure about it. A total of 8,725 citizens voted on this poll. 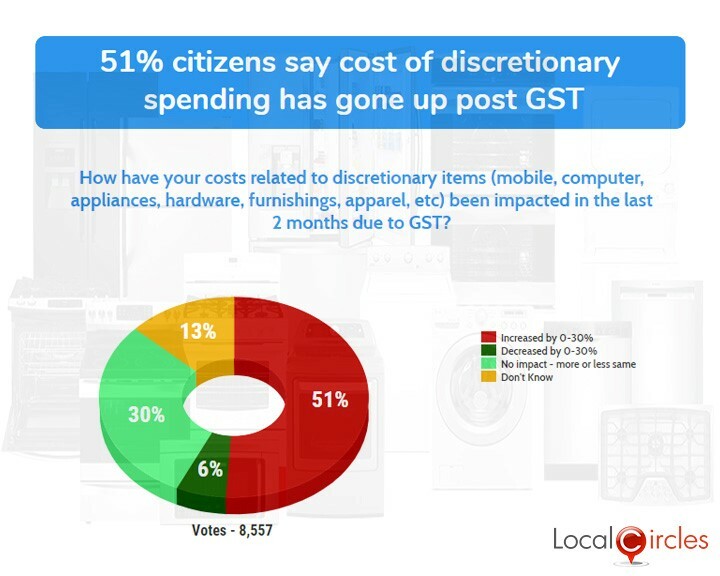 The last poll asked citizens how has their costs related on discretionary items like mobile, computer, appliance, hardware, furnishing, apparel etc. been impacted in the last 2 months. 51% respondents said it has increased and only 6% said it had decreased by 0-30%. 30% said that it is more or less the same and 13% were not sure about it. In various structured discussions on LocalCircles, citizens have said that the government should take steps to improve the understanding of GST for a common man and also make sure that the cost of running a home post GST balances out and does not put too much of a strain on their pockets.